Phoenix? Are we building in Arizona now? No! 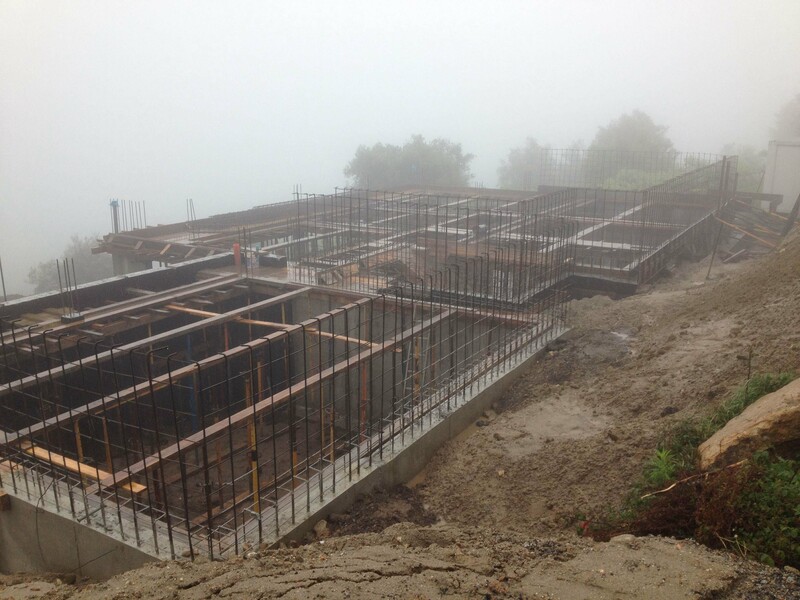 The house in the Minho that last time I wrote was little more than a muddy hole in the ground has begun to rise again. Here it is. It looks huge doesn't it? But remember that half of what you can see, the part nearest to us, is in fact the garage. So how has this change come about? Well Inovlima, the building company, offered us the use of a generator to power the crane for the price of just the gasoline. In addition, through the good offices of both Inovlima and the Presidente da junta, somehow a temporary electrical connection for small machinery has been made at not too great an expense. To English speakers, the Presidente da junta sounds a horribly frightening figure, doesn't he? In fact, Sr. Carlos seems to be an exceedingly pleasant man. It's the word junta that puts us off because we associate it with nasty regimes in South America during the second half of the last century. In this case, however, the junta is the equivalent of that most benign of institutions, the Parish Council. Inovlima, of course, didn't want to lose a contract at a time when work is scarce. The Presidente da junta is eager to have new faces in his parish with all that they bring with them. So it seems that where there's will, there's a way. And with that way, there's now a house. You can see it behind the crane across the side valley. I wrote earlier that the connection is temporary. Now here is the rub. Will it be made permanent? Who can say? Our architect thinks that there is a very good chance that it will be. I have so many crossed fingers that I can hardly pick up a knife and fork. We may eventually find that the current is not strong enough to power all the electrical machines at the same time but we won't cross that bridge until we have to. Curiously we also apparently ran up against a problem with the water main, which did not reach far enough to service our house. 'I say 'apparently' because it was solved before we heard of it. Parish Councils have more influence in Portugal than in the UK and have control of funds to be used at their discretion. In our case, at the request of Inovlima, it seems that the junta decided that it would be a good move to promote future development by extending the mains and making us pay only for the connection rather than for the whole main pipe. Whew! I think everyone realised that another major, expensive problem with utilities would have put the kybosh on the whole project for us. So early this year, this was what began to grow up on a hillside overlooking Ponte de Lima. And now you're probably wondering why we're bothering to build if the weather is going to be like this! 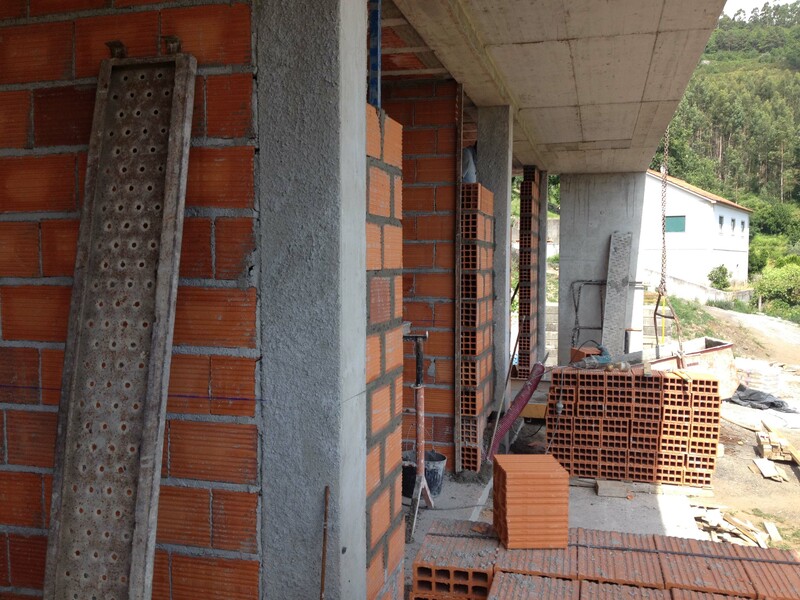 That brings me to another thing: the way building is carried out in Portugal. Developers are building an estate not far from us in York. The walls are built up to the roof line but so far, except for the show house, there are no roofs. 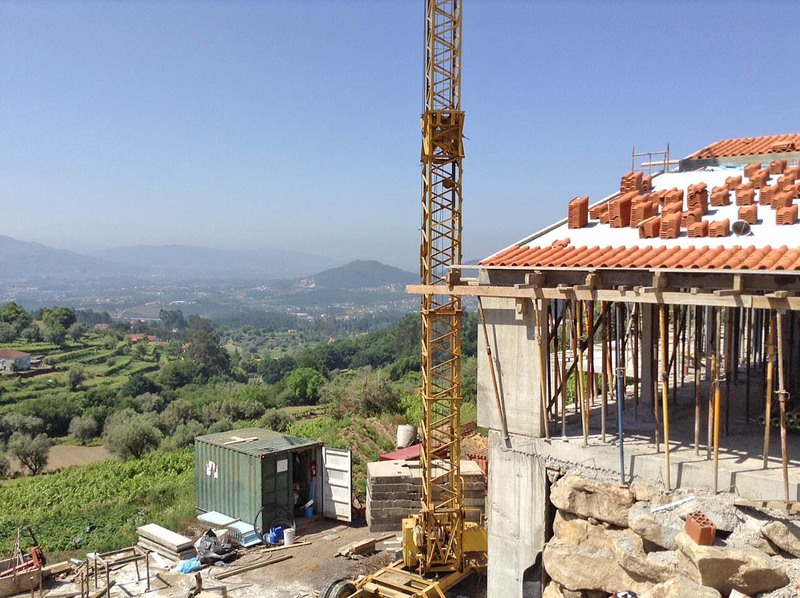 Our house in the MInho, as you can see in the first picture, has a roof but no walls! Somehow this seems the wrong way round: it is much wetter in the UK than in Portugal so you would have thought we would be the ones who were keen to get the roof on first, wouldn't you? 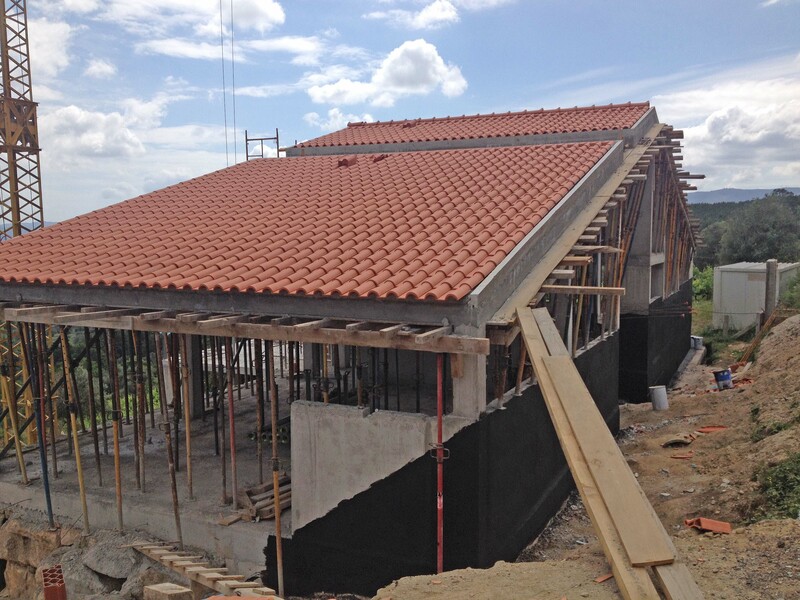 Now that the roof is on, the weather becomes a much less important factor. At the moment, the builders have begun filling in the walls. Soon they will start putting in the other elements of the infrastructure: cabling, pipes, drains etc. So things are coming on and we are excited. The contract states that the house should be finished by March next year but progress has been so good that we are beginning to wonder if it will actually be finished by the end of this year. Let's not tempt fate by hoping for too much. Besides, as in France, much of Portugal grinds to a halt in August. We shall, of course, be understanding if the pace slows noticeably. After all, it's terribly hot then and it's holiday time. All being well, by this time next year we will no longer be imagining what it will be like when we are sitting on the terrace looking at this view. We'll actually be doing it. I'm very happy to hear that things are moving along again and that it looks as though you might have found a workable solution to the EDP issue. Your view looks amazing and I can see why you chose the location. Just beautiful! I'll keep my fingers crossed for you, too. Thank you for your good wishes Julie. It would be good to meet up some time and swap stories. Let's hope we shall be around much more early next year and able to do so. I am learning a lot from your blog and I'm sure you have a lot more to tell. Fantastic! What stories. Isn't this what makes places other than our own so interesting - the way things, ordinary and extraordinary, things are done? Hope to visit you in August of next year. I do you you will make it. 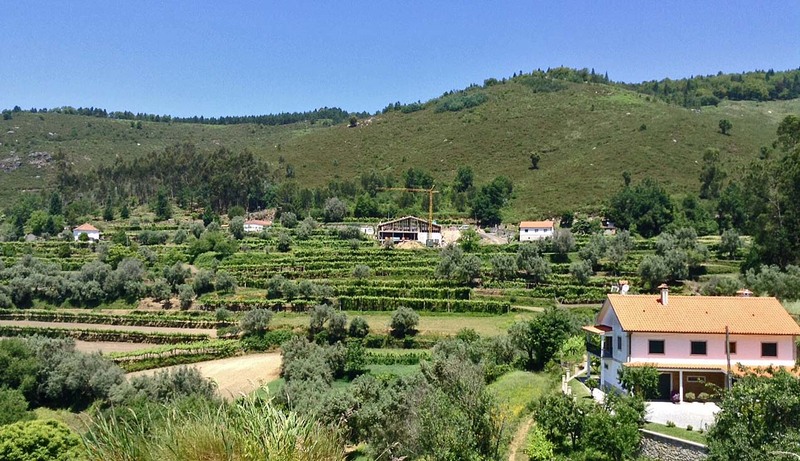 We'll go up into the serras of the Peneda Geres National Park for the cooler air and the views and in Ponte de Lima we'll feast on Portuguese pork and salads, drink cold vinho verde, and delight in the stupendous fruit they produce. Really looking forward to showing you around.